← What is it with squares in nature anyway? The conception of natural history as an economic struggle was developed by Geerat Vermeij (1). “Supply side” interpretations of δ13C excursions in the carbonate shells of marine organisms have been forced to invoke methane hydrates, exponential increases in bacterial carbon remineralization, improbable rates of organic carbon transfer from land, and even carbon laden comets to account for a superabundance of the lighter δ12C preferred by carbonate producing organisms during negative δ13C events, and a superabundance of δ13C during positive events. We propose here a “demand side” approach to δ13C excursions supposing that primary productivity in the biosphere is carbon limited. While volcanism produces infinitesimal amounts of free oxygen and dissociation of water by ultraviolet light a bit more, it is widely accepted that the preponderance of the oxygen, comprising nearly 21% of the atmosphere, was produced by photosynthesis. The equation for photosynthesis is 6CO2 +6 H2O -> C6H12O6 + 6O2. Every pair of oxygen atoms in the atmosphere consumed a molecule of CO2 at its formation. Photosynthesis has been around more than three billion years but oxygen levels in the atmosphere are thought to have remained below 1% until the banded iron formation/red bed (magnetite/hematite) transition about two billion years ago when oxygen concentration in the atmosphere may have risen to 10%. The BIF/red bed transition corresponds generally with the evolution and endosymbiotic assimilation of mitochondria, which used oxygen to first double the ATP efficiency of cellular respiration through the Krebs cycle and eventually turbocharge respiration by an order of magnitude with oxidative phosphorylation. The formula for mitochondrial respiration is C6H12O6+ 6 O2 → 6 CO2+ 6 H2O. Being equal and opposite to photosynthesis, a sustainable economy had evolved which allowed life to proliferate for nearly two billion years and eventually colonize the land. About 375 million years ago in the late Devonian substantial forests of tall trees covered land for the first time. We suppose that this event marks the beginning of a striking increase in O2 and depletion of CO2 that persisted until the end of the Paleozoic. We further suppose that until plants had substantially colonized land, volcanic carbon production (2) had been sufficient to balance the demand from oceanic photosynthesis and the other biological and chemical demands, but the added carbon demand from land plants exceeded the supply. Since the late Devonian carbon and oxygen in the atmosphere have been inversely correlated. 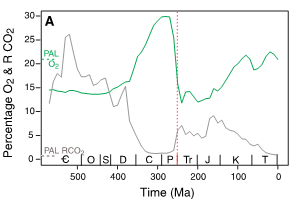 Figure 1 from Huey and Ward (6) using data from Robert Berner shows Phanerozoic O2 and CO2 levels expressed as percentage of current levels. Current levels are shown at the left and the vertical red line is the Permian-Triassic extinction. We offer no explanation for the Permian-Triassic extinction, but suppose that reduced carbon demand and photosynthesis allowed biological respiration to predominate, depleting oxygen and restoring CO2. Late Permian strata contain anomalously high concentrations of fungal spores (7). Large amounts of biological carbon are stored in the geosphere as biomass (predominantly cellulose and lignin); fulvic and humic acids and humins; as carbonate, CaCO4; as methane hydrates and as kerogens of various hydrocarbon compositions. It is estimated that the lithosphere contains 75 million gigatons of carbon as carbonate and kerogens (3). Inorganic carbon is stored as carbonic acid, H2CO3, and its alkaline chemical weathering products like evaporate basins, kaolin clays, and other weathered alkaline sedimentary rocks. All of these biological and chemical processes represent current and historic demands on the carbon supply. While some free oxygen is consumed in chemical weathering, the vast majority of oxygen stored on carbonate and other geological carbon sinks was produced directly from water. Water vapor comprises 37% to 97% of the volume of volcanic emissions (4). It is generally accepted that the water on the planet is mineral and did not consume atmospheric free oxygen in its formation. A small amount of free oxygen is converted to ozone (O3) by ultraviolet light, but ozone has a half-life of hours, it degrades back to free oxygen, and at .6 parts per million (5) in the atmosphere ozone is safely ignored for our purposes. We suppose that oxygen has accumulated in the atmosphere because cellular respiration, the only significant demand on it, produces a biologically valuable end product (CO2) that is quickly recycled; and that carbon is depleted in the atmosphere because it faces many biological and chemical demands with longer cycle times. We find it significant that at .04% current CO2 concentration in the atmosphere is nearly four orders of magnitude lower than the concentration of free oxygen. Seasoned colleagues can remember when a university department was lucky to have a mass spectrometer. The proliferation of these instruments revolutionized science in the late twentieth century and geology benefitted as much as any field of inquiry. 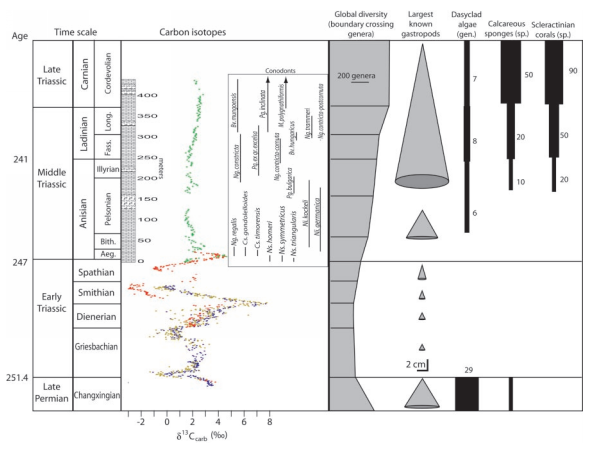 Measurements have been taken of the carbon isotope ratios in the carbonate shells of organisms and the ages of these organisms determined by the decay of other isotopes. Most of this work has focused on marine organisms, but is assumed that on geological timescales the ocean and atmosphere equilibrate. It was noticed that over time carbon isotope ratios were pretty constant but took some surprising excursions. Work is mass over distance and weight is an economic cost. Natural selection has favored organisms that minimized costs, and biological processes select lighter isotopes when they are available. It has become standard practice to plot carbon isotope variation as deviation or anomaly of δ13C, the heavier isotope. Figure 2 by Jonathan Payne et al (8) shows the δ13C excursions of the late Permian and the Triassic. Lower numbers (movement to the left) in δ13C mean that less δ13C and more δ12C is incorporated in carbonate shells. Supply side interpretations of negative excursions postulate enormous influxes of δ12C to account for this shift. We suppose the shift reflects reduced competition for δ12C. It is notable that the negative excursion in the late Permian was only the beginning of a roughly six million year period in the early Triassic of even higher amplitude excursions. We interpret these swings as fluctuations in global carbon demand, with positive δ13C periods coinciding with biological recovery by colonizing (r selected) species and higher carbon demand, and negative δ13C periods coinciding with extinction and lower carbon demand. General recovery from the Permian-Triassic extinction did not begin until after δ13C had stabilized in the mid-Triassic. Figure 3 by Saunders and Reichow (9) shows argon isotope timing of the negative δ13C excursion in relation to the extinction horizon. We interpret the coincidence of the negative excursion and the extinction to reflect the massive reduction in photosynthesizing and carbonate producing organisms and reduced demand for carbon in general and δ12C in particular. The remaining organisms would have had more δ12C available and would have included less δ13C in their shells. Stephen Stanley (10) has found as many as 26 Phanerozoic extinctions associated with isotopic excursions. In all of these the concentration of the heavy oxygen isotope δ18O, similarly selected against in biological processes, covaries in the carbonate shells. We suppose that the isotope excursions did not cause the extinctions, but merely reflect them. 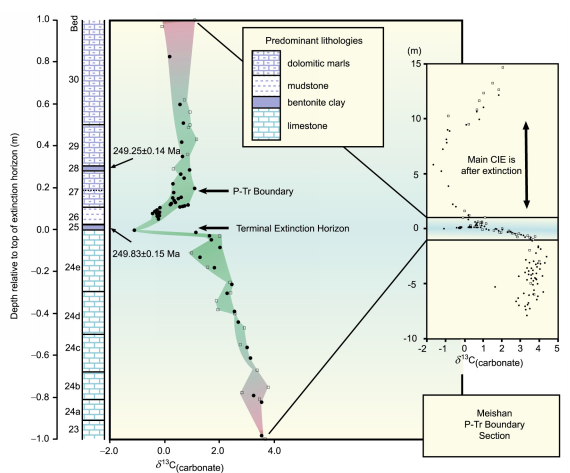 Figure 4 by Thomas and Shackleton (11) shows the oxygen and carbon excursions during the marine extinction near the much discussed Paleocene-Eocene thermal maximum (PETM). Please note that the δ18O scale is inverted and the δ13C and δ18O excursions have the same sign. This time series is especially interesting because it also spans the Cretaceous-Tertiary (K/T) extinction of the dinosaurs. One can see a modest signal at about 65 ma. We notice some similarity with the Permian-Triassic pattern where an initial excursion is followed by higher amplitude events before settling down. We conclude that attempts to understand the relationship between isotope excursions and extinctions have been hampered by a preconception, tied to current notions of carbon and warming, that the excursions must have caused the extinctions. We suppose the opposite, that isotopic excursions reflect demand that waxes and wanes with the abundance of carbon limited organisms. Wolfe-Gladrow et al (12) and Reibesell et al (13) have reported striking increases in plankton productivity when carbon supply is increased. It is widely recognized that the carbon double bond is the chemical basis of life on our planet. We find it easy to suppose that primary productivity is carbon limited. (2) Symonds, R.B., Rose, w.I., Bluth, G., and Gerlach, T.M., 1994, Volcanic gas studies: methods, results, and applications, in Carroll, M.R., and Holloway, J.R., eds., Volatiles in Magmas: Mineralogical Society of America Reviews in Mineralogy, v. 30, p. 1-66. (3) Lal, Rattan (2008). “Sequestration of atmospheric CO2 in global carbon pools”. Energy and Environmental Science 1: 86–100. DOI:10.1039/b809492f. (5) “Science: Ozone Basics.”. http://www.ozonelayer.noaa.gov/science/basics.htm. Retrieved 2007-01-29. (7) H Visscher, H Brinkhuis, D L Dilcher, W C Elsik, Y Eshet, C V Looy, M R Rampino, and A Traverse (1996). “The terminal Paleozoic fungal event: Evidence of terrestrial ecosystem destabilization and collapse”. Proceedings of the National Academy of Sciences 93 (5): 2155–2158. Bibcode 1996PNAS…93.2155V. DOI:10.1073/pnas.93.5.2155. PMC 39926. PMID 11607638. //www.pubmedcentral.nih.gov/articlerender.fcgi?tool=pmcentrez&artid=39926. (9) Saunders, A.D and Reichow, M.K. 2009. The Siberian Traps and the End-Permian mass extinction: A critical review. Chinese Science Bulletin, 54, 20-37. Download pdf. (12) Wolf-Gladrow, B. D. A., Riebesell, U. L. F., & Burkhardt, S. (1999). composition of marine plankton, 461-476. By policy of Geological Society, London. This entry was posted in Biology, Climate, Climate Change, Economics, Geography, Geology, History of Life, Oceanography, Paleoclimate and tagged banded iron formation, Climate, Earth, environment, Isotopes of carbon, Jonathan Payne, Michael Benton, Permian, Permian-Triassic, Permian–Triassic extinction event, science, Triassic. Bookmark the permalink. Although an interesting argument, you fail to take account of the relative quantities involved. Excluding geological reservoirs, the Earth has three major reservoirs of carbon that are in effective equilibrium, the biosphere, the atmosphere plus surface ocean, and the deep ocean. Because they are in effective equilibrium geographical or ecological changes that bring about a permanent change in one reservoir must increase the content of the other two. In particular, carbon lost from the biosphere will be stored in the atmosphere/surface ocean, and the deep ocean in a proportion that retains the current ratio between the two reservoirs, all else being equal. As it happens, the biosphere represents 5% of all carbon in the three reservoirs. That means the complete loss of the biosphere would only result in a 90 Gt increase in Carbon in the atmosphere/surface ocean, or a 5% increase. By similar reasoning, it can be seen that the increase in atmospheric CO2 from the complete loss of the biosphere would only amount to a 5% increase, or 14 ppmv, far too small to account for past CO2 excursions. 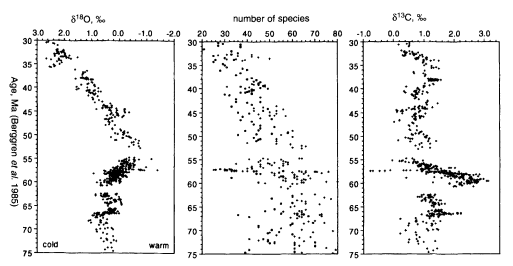 To compound your difficulties, you have assumed that loss in biomass is linearly correlated with loss in species diversity. That is not true. If a species is lost, its ecological niche will be divided among its nearest competitors. The lost biomass from the missing species will be made up for by increased biomass for the competitor species. The new ecological arrangement will not be as efficient as the old, resulting in some loss of biomass – but proportionally the loss will be small. It is true that during the period of extinction biomass will be suppressed beyond that level, but ecosystems recover quickly in geological terms (if not in human terms) so that any fluctuation in Carbon levels in various reservoirs are likely to be undetectable because to rapid at the temporal resolution of the geological record, as well as being too small to be detected for reasons previously given. We detect excursions by measuring the concentrations of isotopes in the shells of calcifying critters. The sizes of the reservoirs does not matter to these critters, only the concentrations within their “reach”. If their neighbor just ate the last 12C nearby, they are forced to incorporate 13C. If their neighbor died last week, they get the 12C. My arguement is that the availability of carbon for these critters is related to the total carbon in the system. Cycle times are key. The average cycle time for the deep ocean is probably a thousand years. The cycle between the atmosphere and upper ocean is poorly understood, works in both directions, and seems highly temperature dependent. I’m guessing years if not decades. The critters build their shells in realtime. gymnosperm, it is unusual for fossil strata to have resolutions of less than 100,000 years. Consequently, if you are lucky, you can only tell the time of formation of a shell within 100,000 years. Should you collect 100 shells from the formation, they may be equally scattered in time over the 100,000 years. This would be the case for foraminefera, for exampe. For sessile animals, however, it is more probable that the shells will all come from one, or a few thousand year periods within the 100,000 year interval. That is because local conditions can change on a much smaller time scale than 100,000 years. Consequently it is unlikely that a significant portion of your sample will come from the approx 1 year required for the atmosphere to reach equilibrium with the surface ocean, or the approximately 250 years for it to reach equilibrium with the deep ocean. Therefore, in interpreting the fossil record, you must assume that atmosphere, surface ocean and deep ocean are in near equilibrium and project the increase C12 accordingly. Note that the fact that you are only interested in released C12 makes no difference on this point. If the release of all the carbon in the biosphere can only increase atmospheric CO2 by 5%, it will have a similarly small effect on the decrease in the C13/C12 ratio. You may suppose that fossils would form most frequently at the time of the mass extinction itself, thereby preferentially sampling the short period in which equilibrium is not reached. That supposition is, however, false. Actually fossilization is less likely in the immediate aftermath of a mass extinction because there are fewer organisms to be fossilized. Therefore the bias will be to periods several generations after the mass extinction when a working ecology has reestablished itself, and when, therefore, biomass is minimally affected, and when the surface/ deep ocean equilibrium has had time to establish itself. Finally, as you note, if an organism dies it soon has its carbon taken up by a neigbour. This is a large part of my point. Mass extinctions do not significantly decrease the total biomass on the Earth. The few times in which they do it is because of a very rapid extinction, and the reduction is short lived and in a period leaving few fossil records, and hence little ability to assess the C13/C12 ratio. As a small addendum, it seems clear that the figure from Thomas and Shackleton falsifies your claim. Although the spike in C12 from the PETM is clear, there is no equivalent spike for the much larger K-T extinction event (65.5 mya). Indeed, the period leading up to the K-T event shows a increasing C13/C12 ratio. During that period, there was an increasing rate of extinctions due to a gradual cooling of the environment, a cooling that was often been postulated as the reason for the extinction of the dinosaurs. Based on your theory, you would therefore predict an decreasing C13/C12 ratio over that period, with a large fall in that ratio coinciding with the K-T extinction event. We need to get some definitions. I consider the “upper ocean” to be the mixed layer at about where the beacon lettuce and tomato (BLT, just kidding), meets the thermocline. About 80m. This happens to be the depth at which something like 90% of the UV is attenuated. I consider this layer to be the inverted analog of the troposphere. Like the troposphere it is thicker at the equator and thinner towards the poles. Do you seriously think this layer equilibrates with the atmosphere in a year? Have you seen the ages of the deep ocean? Check out Gebbie and Huybers. 250 years does not work for me. My argument is not about emissions, it is about consumption. Some critters both photosynthesize and calcify, and others just respirate and produce carbonate shells. It doesn’t matter if since the late Devonian there hasn’t been enough carbon for everybody. All that matters is the carbon available to the critter making its shell. We are talking about rapid extinctions here. There was a marine regression in the late Cretaceous and these are often associated with cooling, even glaciation. My sense is that in this case it more likely represents a relaxation from the extreme rates of seafloor spreading and emplacement of suboceanic large igneous provinces that characterize the Cretaceous. Many things can cause extinctions. Marine regressions draining the continental shelves where most of our critters live, impacts, sulfur(the other)dioxide sterilizing the biosphere. There is reason to believe extinctions might occur during positive 13C excursions from competition when a new adaptation like the reproductive advantage of angiosperms or C4 photosynthesis allows rapid expansion and carbon uptake at the expense of the predecessors. like to be a part of group where I can get feed-back from other knowledgeable individuals that share the same interest. I honestly don’t know of any discussion boards. I figure the interested audience is pretty small. Wattsupwiththat has geoscience posts sometimes with a group of pretty astute commenters, but the thrust of the site is political.